The Kartchner Caverns Macro-Invertebrate Project is a collaborative research venture among Arizona State Parks, the University of Arizona Insect Collection, and scientists and educators at a number of other institutions. Project research includes study and documentation of the biology and ecology of macro-invertebrates occurring within Kartchner Caverns State Park. The project provides information to Arizona State Parks and supports a science-based approach to management and preservation of this remarkable and irreplaceable publicly-owned resource. We also support public outreach to further understanding and appreciation of the fascinating and often unique, endemic arthropods occurring within the park. The initial focus of our studies is on macro-invertebrates living in the cave, but studies involving surface invertebrates will eventually be integrated into project efforts. In a hole in the ground, there lives a microbe. Actually, there live several microbes. What are they and how do they survive in conditions practically devoid of resources or other forms of life? Doctoral candidate Marian Ortiz in the University of Arizona's department of soil, water and environmental science is trying to find out. Photo right: Doctoral candidate Marian Ortiz in the UA's department of soil, water and environmental science samples microbes that live on the surface of stalactites and other mineral deposits in Kartchner Caverns. Her study site is Kartchner Caverns, designated a National Science Foundation Microbial Observatory in 2006. Ortiz's findings indicate that some of the cave-dwelling microbes could produce compounds with antimicrobial and antifungal properties. If so, the microbes could be a valuable resource for substances to help fight new diseases and pests. In the first extensive genetic survey of microbes living in Kartchner Caverns, UA doctoral candidate Marian Ortiz has shown that some of the cave-dwelling microbes may have anti-microbial and anti-fungal properties. It all began with a drop of water. A shallow inland sea covered this area 330 million years ago, depositing layers of sediment that eventually hardened into limestone. Millions of years later, this Escabrosa limestone, along with other rock layers, uplifted to form the Whetstone Mountains. The Escabrosa limestone, due to a type of tremor or fault, down-dropped thousands of feet relative to the mountains above. Kartchner Caverns' wide variety of decorations, called “speleothems,” began forming drop-by-drop over the next 200,000 years. 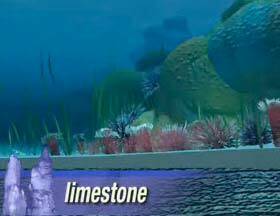 Water seeping from the surface dissolves minerals on its trip through the limestone. Once it reaches the cave, the trapped carbon dioxide escapes from the water. No longer able to hold the dissolved calcite, the drop deposits its tiny mineral load. Over time, these minerals have created the beautiful speleothems and variety of colors found in the cave. Kartchner Caverns is a “living” cave; the formations are still growing! Some North American bats leave hibernation with little sign of the devastating effects of white-nose syndrome, a fungal epidemic that has claimed the lives of some 5 million bats since it first emerged in winter 2005. But even though those bats seem to have survived the fungal disease, their immune systems reactivate and can then inexplicably — and devastatingly — kick into overdrive, a new study reports. These animals appear to have what immunologists call immune reconstitution inflammatory syndrome or IRIS. The discovery of the condition in bats “is the first potential example of IRIS that has ever been seen outside a human patient,” observes wildlife pathologist Carol Meteyer of the U.S. Geological Survey in Madison, Wis. Until now, most IRIS victims have been HIV patients treated with medicines to restore flagging immune systems. In May 2010, a bat collected from a cave in western Oklahoma has tested 100 percent positive for the fungus associated with white-nose syndrome (WNS). White-nose syndrome has already caused the death of more than 1 million bats in the eastern United States. This latest finding in Oklahoma puts WNS approximately 600 miles from Ariz. WNS is expected to continue to move westward. The Arizona Game & Fish Department is currently beginning to outline a response plan and looking at where to target surveillance activities for winter 2011. Because of the scarcity of hibernacula records in Arizona, there are plans to begin collecting temperature/humidity data from a number of caves/mines to help prioritize areas for monitoring. In addition, the agency is keeping abreast of the latest WNS news and engaging dialogue with neighboring states through a variety of avenues. For more information on Arizona's response, contact Angie McIntire, Bat Specialist, Arizona Game & Fish Department, at (623) 236-7574. During the summer months, the cave's Big Room serves as a nursery roost for over 1,000 female cave myotis bats. The pregnant females return to Kartchner Caverns around the end of April, where they give birth to a single pup in late June. The babies remain in the roost each evening while their mothers forage for insects in the surrounding countryside. During the summer, the colony consumes about half a ton of insects, consisting of moths, flying ants, beetles, mosquitoes, and termites. Mothers and their offspring will leave mid-September, to begin their migration for their winter hibernation roost. These bats provide the only link between the ecosystem of the cave and the surface. After returning to the bat roost from their nightly forays, the bats excrete waste, forming large guano piles. Most of the other life forms found in the cave depend on these guano piles for their food. Fungi and bacteria consume the guano first. These are in turn eaten by nematodes, mites, isopods, amphipods, and book lice. These are then eaten by spiders, scorpions, mites, millipedes, and centipedes. Scavengers, like crickets and beetle larvae, clean up the leftovers. The bats' guano provides the energy needed to run this complex food chain. For more information, read the feature story about bats. Joe Vaughan samples a sizeable guano deposit in the Big Room. This pile, covered with a fungal-rich layer, was deposited last summer by cave Myotis (Myotis velifer). Some of you may know that mycology is the study of fungi. However, did you also know that even though all molds are fungi, not all fungi are molds? So, we invite you to stay tuned on this project and others taking place at Kartchner Caverns State Park that support the park’s mission for continuing discovery, promoting science-informed and adaptive cave management, building advocacy for conservation and education, and showcasing only a portion of a more extensive and beautiful cavern system that is so worth protecting. This recent mycology program is in partnership with graduate student, Joseph Vaughan, who is working under the direction of Dr. Barry Pryor from the Department of Plant Sciences at the University of Arizona. Although micro-fungi make up an essential portion of the microbial population in many ecosystems, not enough is known about the different types, distributions, life cycles, and intricate linkages that fungi play in caves and their supporting surface environments. Kartchner Caverns, having been developed and maintained in order to protect a range of biological communities, provides an excellent laboratory venue to examine microscopic cave-inhabiting microbes and fungi in a nearly pristine environment. This project proposes to investigate fungal communities living in association with bat guano, an essential nutrient source for many cave ecosystems. In addition to exploring the species richness of fungi living on or near the guano, this project will examine fungal community diversity and life cycle changes across a gradient from the Sink Hole entrance of the Big Room complex, where our bats raise their young during the summer months. The project will address questions about the source of various fungi in Kartchner Caverns and how these fungi are distributed through the cave. The idea is to learn if types and locations of different fungi in the cave are constrained to only bats as vectors, to learn if and why fungal types vary in their distribution on the piles and throughout the cave, and if locations and growth vary in time and space check out Joseph's research brief. While exploring the cave, paleontologists, those who study prehistoric life, uncovered an 86,000-year record of the local faunal community. The finds included the following: skeletons of an 86,000-year-old Shasta ground sloth, a 34,000-year-old horse, and an 11,000-year-old bear, as well as terrestrial snails, a clam, a toad, lizards, rabbits, snakes, a coyote, a ringtail, and many species of rodents. These discoveries have lead paleontologists to declare Kartchner Caverns a treasure house of information on the local fossil history of the uplands around the San Pedro River Valley. The University of Arizona Cooperative Extension, SAHRA, and Arizona State Parks jointly created an interactive website about the key role of water in the history and evolution of Kartchner Caverns and the San Pedro River Basin. The online program introduces the hydrology of the caverns: how water created the cave spaces and formations, how it continues to shape the caverns today, and the water cycle of the Upper San Pedro Basin. An inter-agency study examined variations in bacteria on the various formation at Kartchner Caverns. Download poster (below) to learn more. 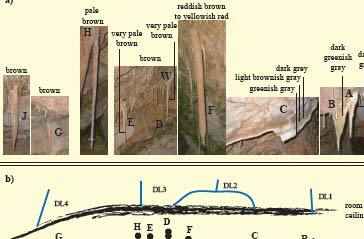 Abstract: Kartchner Caverns is a 3.9 km long wet living carbonate cave in the southwestern USA near Benson, Arizona. The cave represents an oligotrophic environment with high humidity (average 99.4 percent) and elevated CO2. Because of its unique geology, Kartchner Caverns contains minerals from six different chemical classes: carbonates, sulfates, oxides, nitrates, silicates and phosphates, and is considered as one of the top 10 caves in the world in terms of mineral diversity. Furthermore, Kartchner is also characterized by its variety of speleothems (secondary mineral deposits). In 2006, the cave was added to the National Science Foundation’s Microbial Observatory Program. One goal of our studies in Kartchner is to characterize the heterogeneity of bacterial communities on speleothems. The objective of this study was to explore both, intra- and inter-speleothem variability in the bacterial community structure. Ten different formations located in a single cave room within an area of approx. 10 m (length) x 2 m (width) were examined. A chemical element profile of a surface sample scraped from each formation was performed using ICP-MS analysis. The analysis revealed differences in the elemental content of the ten formations. Bacterial DNA community fingerprints were generated from each speleothem using DGGE analysis of PCR-amplified 16S rRNA gene fragments. The intra-speleothem analysis revealed that the community profiles from the same formation are more similar to each other than to profiles from different speleothems. For the inter-speleothem analysis, bacterial community clusters were observed that appear to be influenced by the spatial location of the formation in the room. Approximately 20 percent of the earth’s dry ice-free surface is composed of karst terrain (Ford and Williams 2007) with sinkholes and caves being typical features of these regions. Kartchner Caverns, one of the world’s 10 most interesting caves from a mineralogical standpoint (Hill and Forti 1997), is a 3.9 km long cave developed into a block of Escabrosa Limestone (Lower Carboniferous) in the Basin and Range of southeastern Arizona (Jagnow 1999). The relative humidity inside the cave averages 99.4 percent. The atmospheric CO2 is elevated (varying seasonally from approx. 1,000 to over 5,000 ppm) and the mean average temperature throughout the cave is 19.8 degrees celcius (Buecher 1999). For more information, visit Informaworld. Kartchner Caverns in Benson, Ariz., was opened for tourism in 1999 after a careful development protocol that was designed to maintain predevelopment conditions. 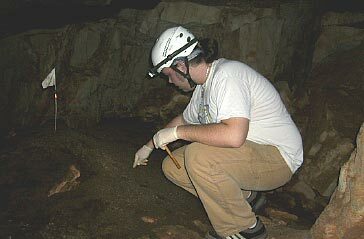 As a part of an ongoing effort to determine the impact of humans on this limestone cave, samples were collected from cave rock surfaces along the cave trail traveled daily by tour groups (200,000 visitors year–1) and compared to samples taken from areas designated as having medium (30–40 visitors year–1) and low (2–3 visitors year–1) levels of human exposure. Samples were also taken from fiberglass moldings installed during cave development. For more information, visit SpringerLink. 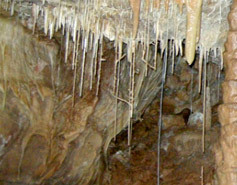 In 2006, Kartchner Caverns was added to the National Science Foundation's worldwide network of Microbial Observatories. The goal of the Microbial Observatories program is to study and describe the phylogenetic (who is there) and functional (what do they do) diversity of microbial communities on the beautiful formations found in the cave. Kartchner Caverns is the only cave in the network. The Kartchner Caverns Microbial Observatory is a collaboration between the laboratories of four investigators at the University of Arizona: Dr. Raina Maier, Dr. Leland S. Pierson III, Dr. Barry M. Prior, and Dr. Rod Wing.